American pattern scythe blades traditionally come from the factory with the tang flat, and they are adjusted to the proper angle for the user and their snath by heating and bending for optimal mowing performance. This image series shows our method of going about it, using a Seymour Midwest Tools 30″ grass blade. If you do not have the tools necessary to perform the bending yourself, a local blacksmith, machine shop, or auto mechanic will likely be able and willing to perform the job. The angle you will need will depend on your height, stance when mowing, the tuning of your snath, how much bend or “lift” there is in the neck of your snath (typically about 25° in most American snaths) and your intended mowing environment. In general a good rule of thumb is that the edge should ride about the thickness of your fingertip above the ground when in mowing stance. A lawn blade may need a slightly lower lay, and if mowing in very heavy or thick vegetation or on bumpy terrain a slightly higher lay may be preferred. See where your blade rides with the tang unbent and determine how much you want to lower it. This will be the amount of bend you’ll be introducing to the tang. 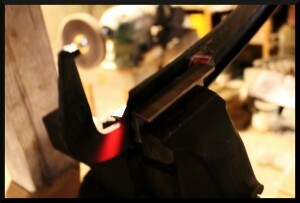 The blade clamped in such a way as to minimize strain on the web during bending. Clamp the blade securely in a sturdy vise. Care should be taken so that when the tang is torqued the strain is carried by the rib rather than the thin web of the blade (the span between the rib and the edge.) 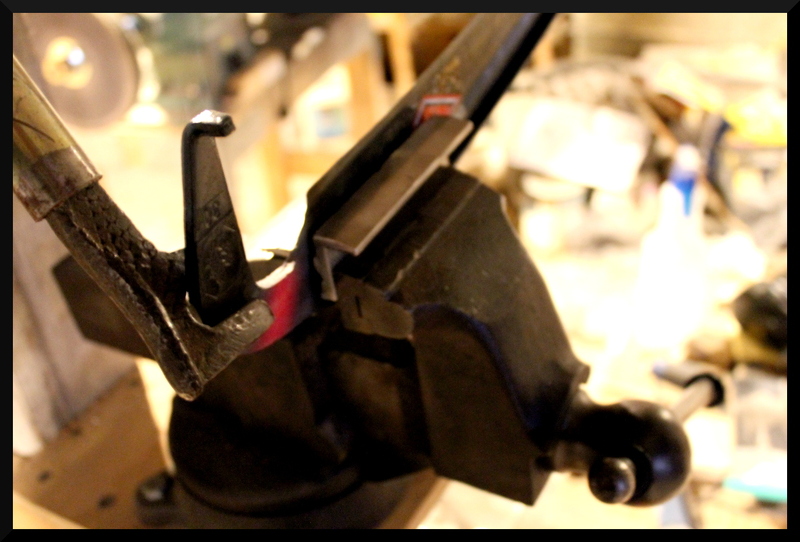 Here aluminum vise pads are being used both to appropriately manage the sites of pressure, but also to avoid marring the blade. 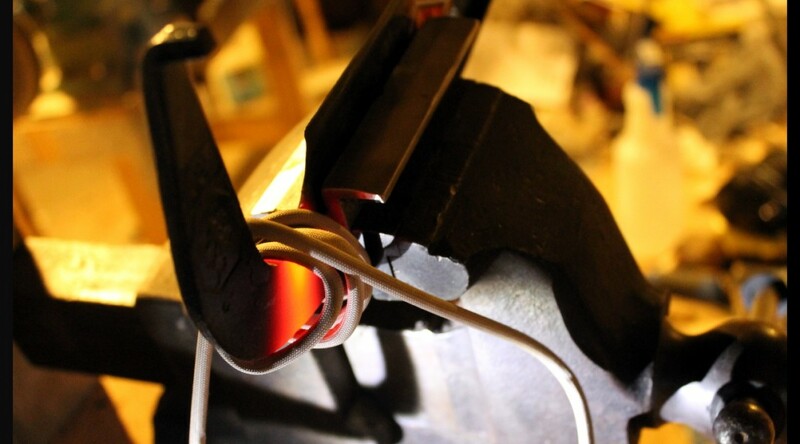 Heating the shank with an induction heating coil. An induction heater uses magnetic frequencies to rapidly excite the iron molecules in the steel in only the narrow band contained by the coil. Heating the shank of the tang to prepare it for bending requires caution to avoid also heating the edge at the heel of the blade. We use an induction heater, which rapidly heats a narrow band of steel within the confines of its electromagnetic coil, but this is an option few will have. A torch (either MAP gas or oxy acetylene) is much more common, but greater care must be taken with them to mitigate heat migration away from the site of application. A raw potato can be stuck on the edge as a heat sink, or the base of the blade wrapped with a soaking wet rag. Try to keep the heat as confined to to the shank as possible, as this is where you want the bending to occur. 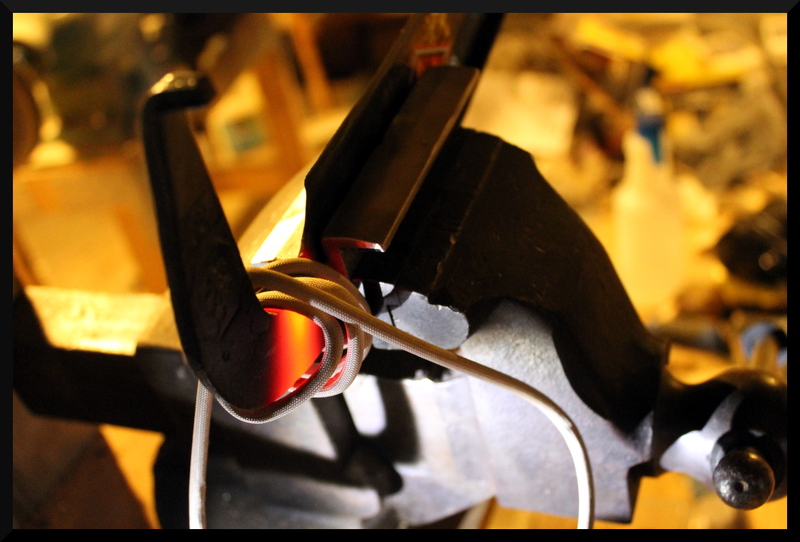 Bring the metal to at least moderate red heat before attempting to bend. 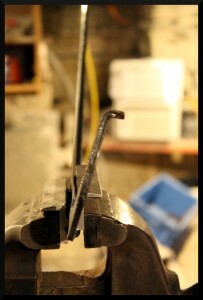 The shank of the tang has been brought to acceptable heat and is now ready for bending. 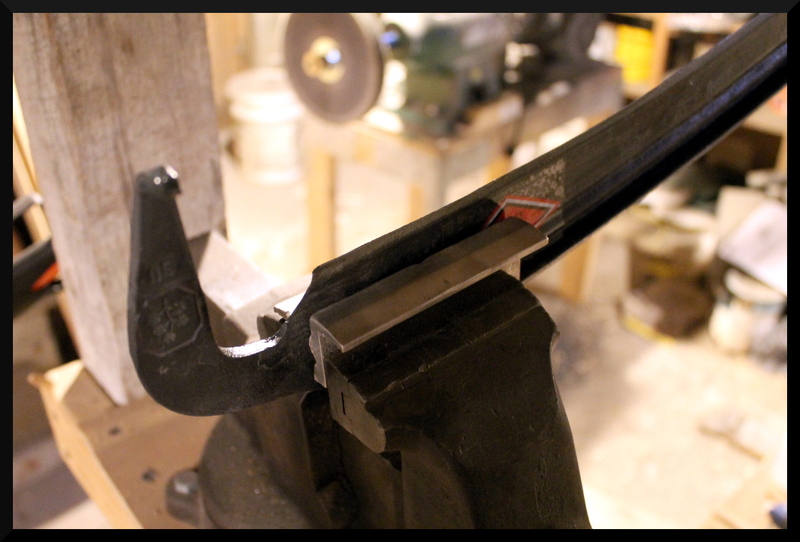 Now that the tang has been brought to sufficient heat, twisting force needs to be applied to the tang to impart the desired angle of lift–what is known as the “cray” or the “tack” of the tang. A bending fork is the ideal way to do this (it makes it much easier to control the bend) but you can slip a pipe of appropriate dimensions over the tang to do the job as well. Positioning the bending fork. A pipe may be slipped over the end of the tang if a bending fork is not available, though a fork gives the best results. The bending fork or pipe should be close at hand during the heating process so you can get it in position without losing too much of your heat. Apply your pressure in a smooth and controlled manner so you can gauge if excessive stress is being placed on the blade itself. If resistance becomes too great, reapply heat as necessary. It is ideal, however, to get the tang angle set in a single heat. The end results of the bending. This tang has been given about a 12° tack. After bending, allow the tang to air cool–DO NOT QUENCH. Cooling the blade with water or by other rapid means would harden the steel, rendering it brittle. You want the metal to cool slowly so that it will be soft and tough to better resist strain during mowing, and prone to bend rather than snap if abused.